My art is a revelation of cultures from past and present. These influences from around the world are interwoven into my life and expressed through my art. The use of ancient Raku technique of firing pieces adds to its natural form expressing deep cultural bonds. I want to bring to the viewer a sense of connection: a connection to their past or to memories of a simpler life. I believe the things we see and the way we express them are a reflection of who we are. These sculptures are the way I view the world. The y open a door into the creator’s imagination and allow others to share in the moment. The real question isn’t if the true meaning is found by all, but that all find meaning in my art, in sharing, and in life. Kristena is a published artist from Utah. She was born in Oceanside California and studied at St Charles College Missouri, the University of Utah, Utah State University, Utah Valley University, and Brigham Young University. She has traveled the world studying art of different cultures, finding a touch of the master’s hand in the hearts of all people. 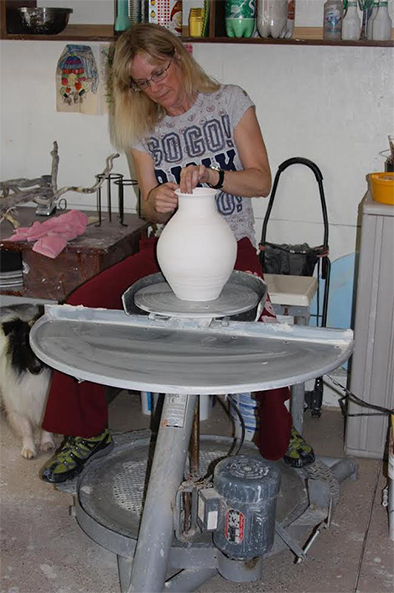 She chooses to paint, sculpture and form pottery from the heart of life itself. Through her work she invites all to feel apart of the magical mystery found in the soul of mankind.